Don't spend any more on a genuine trailer wiring kit for your LR4 when you can purchase a high-quality kit for a fraction of a price. We've paired our highly rated LR4 trailer wiring kit with Clearview's premium full replacement towing mirrors to provide you the complete package for all your towing needs. With Clearview's full replacement mirrors, you don't need to do any additional drilling, they use the original side mirror cutouts for your stock mirrors and the original electrical hookups, so no need to snake any additional wiring either! With our trailer wiring kit, we provide you all of the wiring and connectors that you need, including an OE-spec harness, interchangeable Flat-4 and 7-way connector ends, and easy-to-follow instructions! 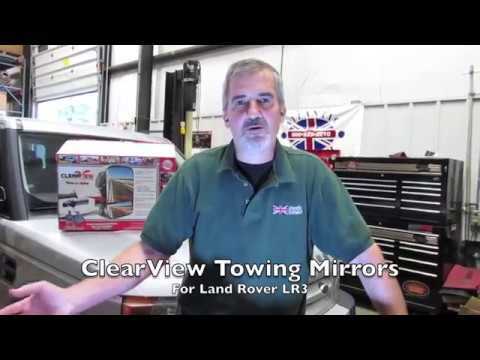 As integrated replacement towing mirrors, Clearview Mirrors completely replaces your stock LR4's side mirrors using your original equipment mirror cutouts, fittings, and wiring on your Rover. These mirrors are designed for enhanced viewability, function and style and are quality-manufactured for exceptional fit and finish and longterm durability.